The Moonshots team is the innovation team of Influitive. Our goal is to create new products in the Advocate Marketing space. For our first project, we wanted to create an easy and natural experience for professionals to advocate for their favorite companies. 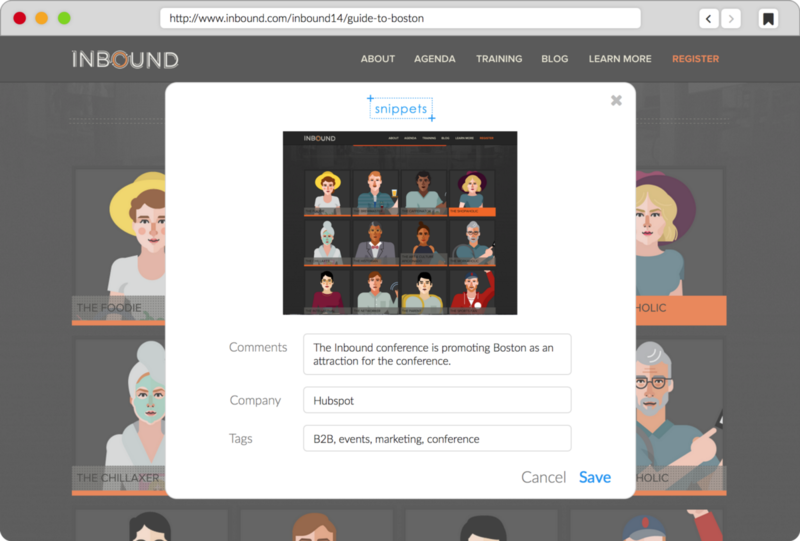 We chose to focus on B2B SaaS marketers because they are Influitive’s key customer base. Our first step was to learn about their professional needs and industry trends. We interviewed over 30 marketers from different marketing functions, seniority level, and company size. We learned about their roles, professional goals, difficulties at work, and industry trends. 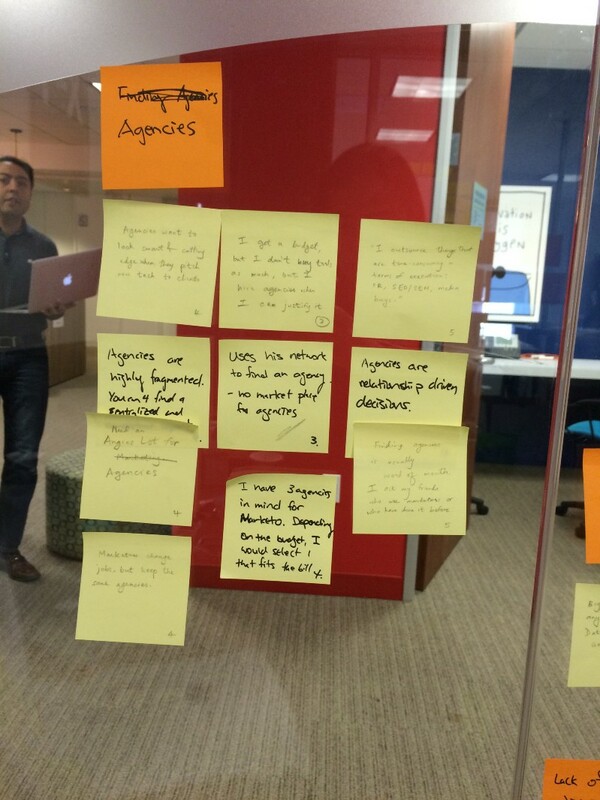 We used affinity diagram to capture key insights and uncover common themes. We explored each theme further by conducting more interviews. As a team, we brainstormed ideas tackling each of the themes. We then went back to our research participants for feedback. We used the feedback to refine and reform the ideas. 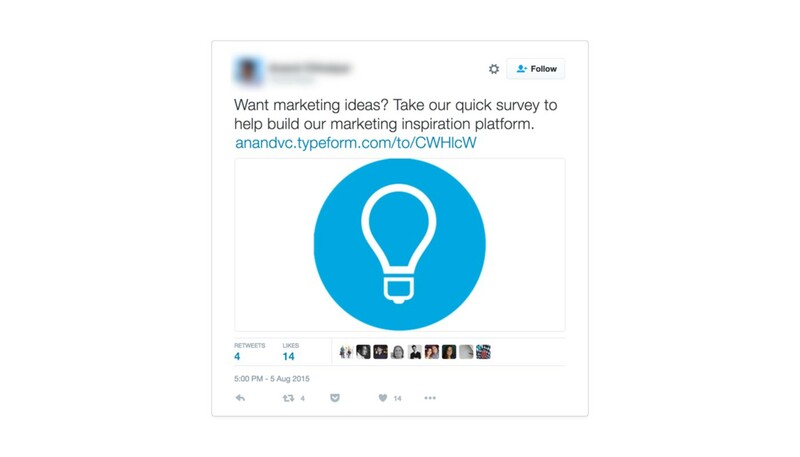 We created Twitter ads and simple landing pages to gather interests on these ideas. We then reached out to the hand-raisers and learned more about their needs. One of the Twitter ads we ran to gather interest. 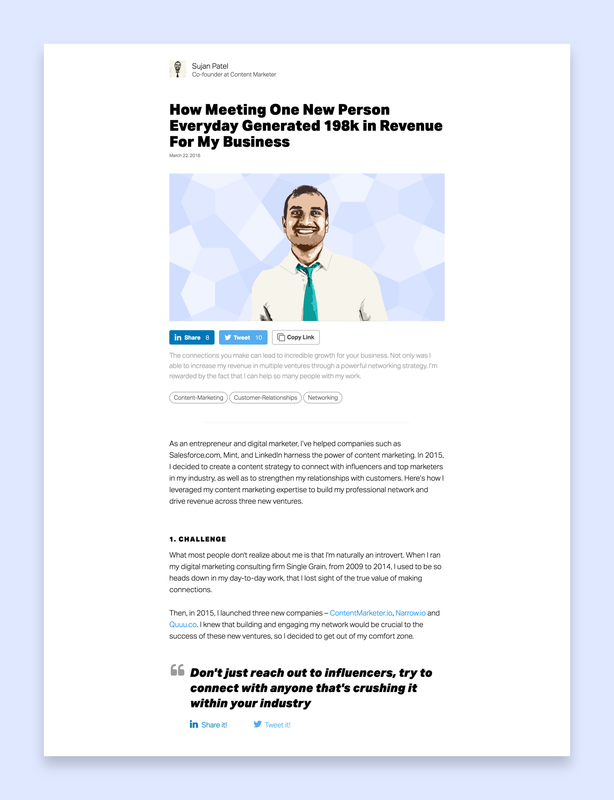 We continued to iterated with on ideas that had high sign-ups. We brainstormed features based on our learnings. I would then draft mocks and bring them back to the hand-raisers for more feedback. 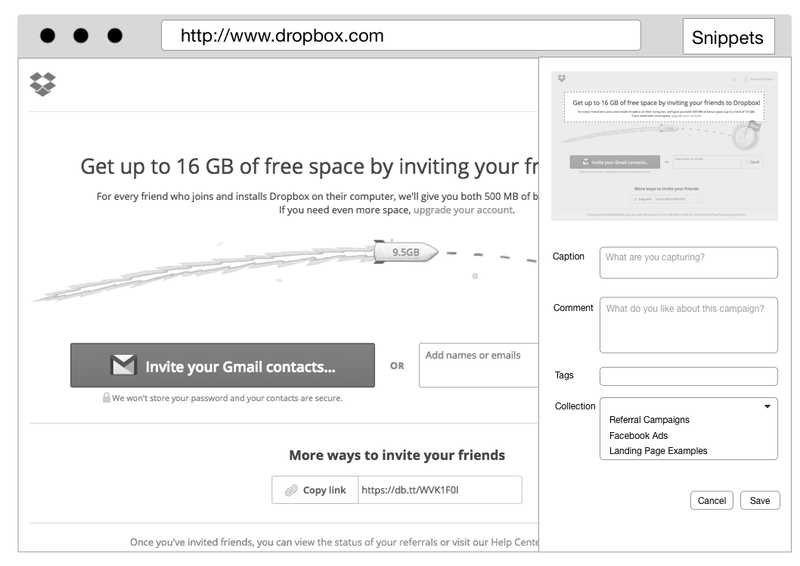 Low fidelity wireframes for one of the ideas. L-F wires are used for early interviews. If our majority of our participants are excited about the idea, we start adding details to the idea and create high fidelity wires. High fidelity mocks. They are used for user interviews and validation. 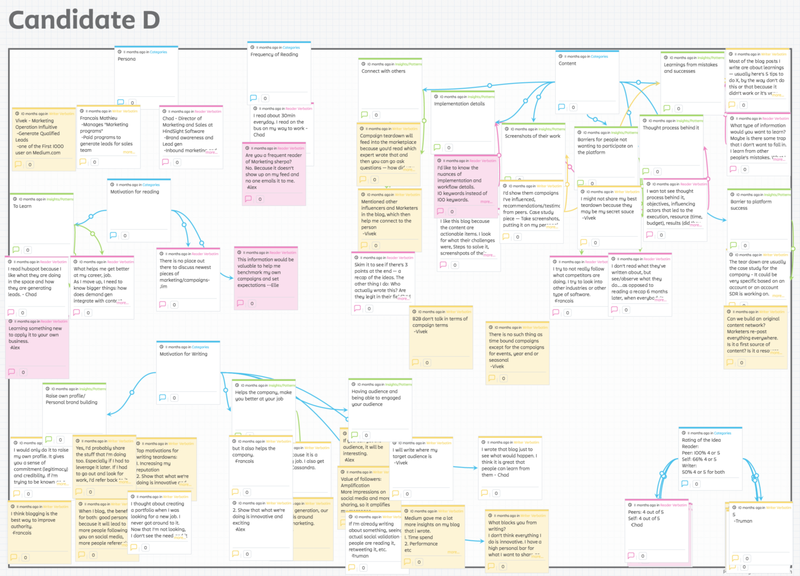 Affinity diagram for one of the many ideas that we tested. 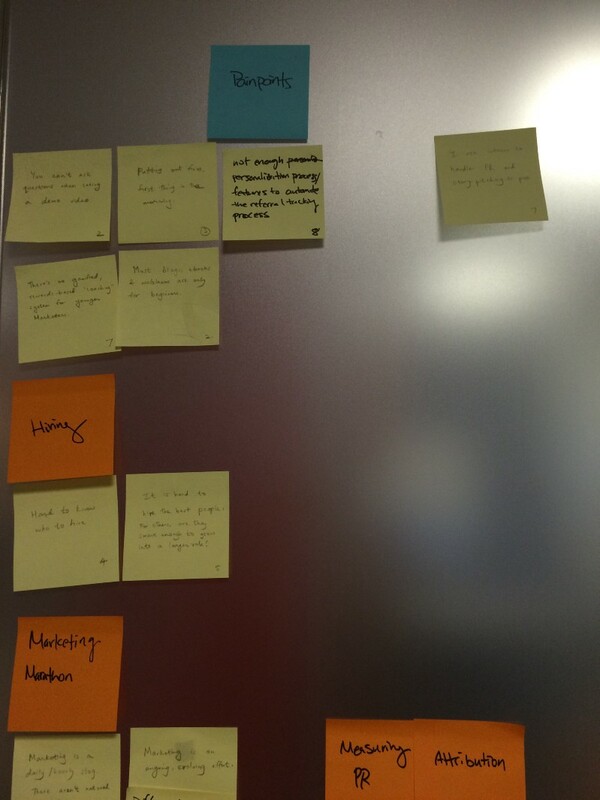 Since we didn’t have much wall space, we started creating affinity diagrams on Stormboard. The idea that we believed had the most potential was Upshot. 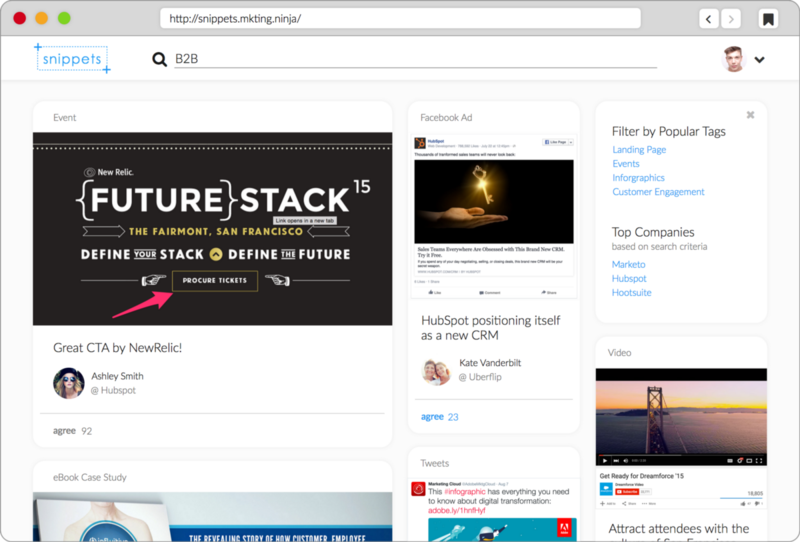 Upshot helped marketers highlight their achievements by helping them share a past success. However, writing is no easy task. 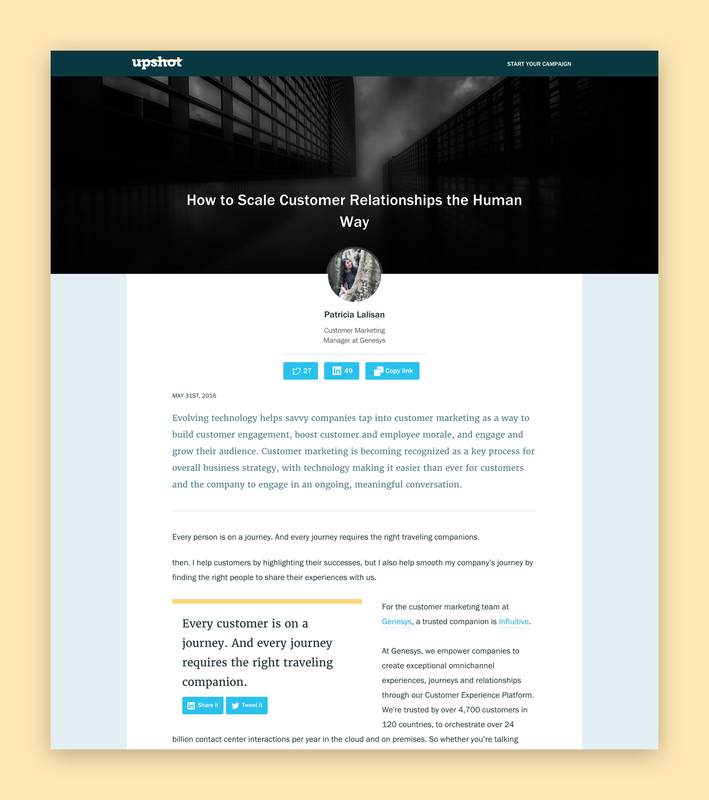 We made it easier by helping users decide on a topic, ghost write the piece for them, and then distribute the story to their network. 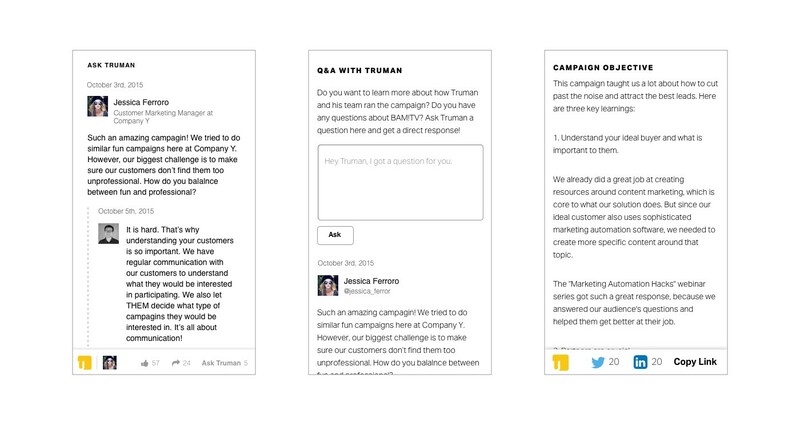 We ran a high-fidelity experiment and created 6 Upshot stories. 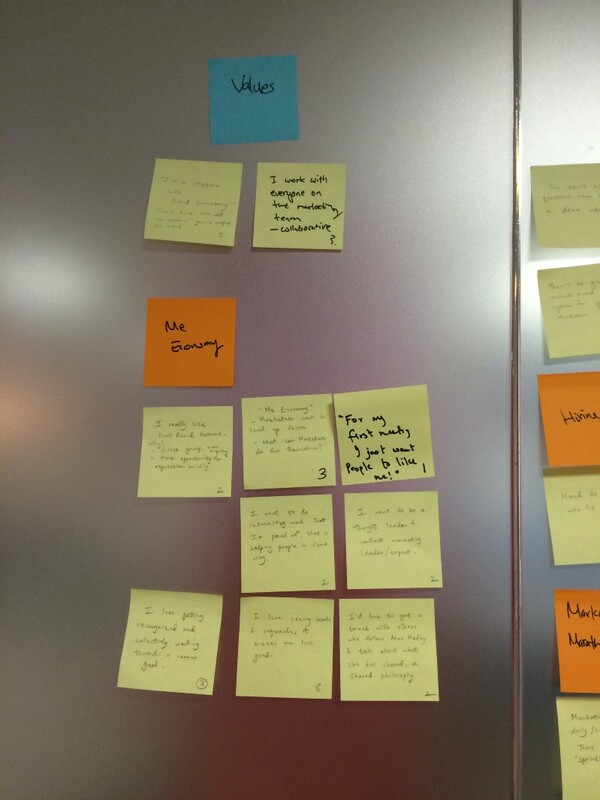 My role was to identify what makes a good Upshot story, lead UX/UI, and helped the dev with front-end code. Upshot published six stories. Majority of the contributors enjoyed the experience of creating with Upshot. Each story also received strong reader traffic. Below are a few screenshots from the Upshot experiment. You can see a saved version of an Upshot story here. 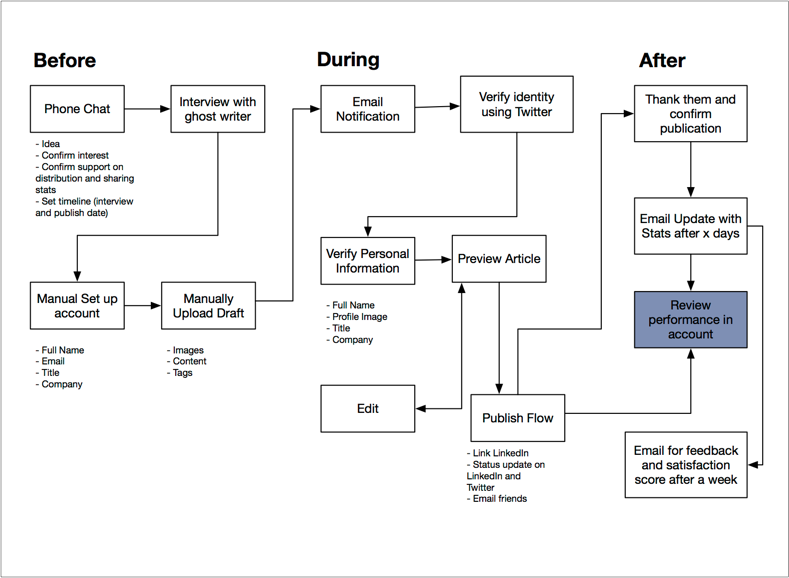 For companies, new and fresh content are important part of their lead generation funnel. 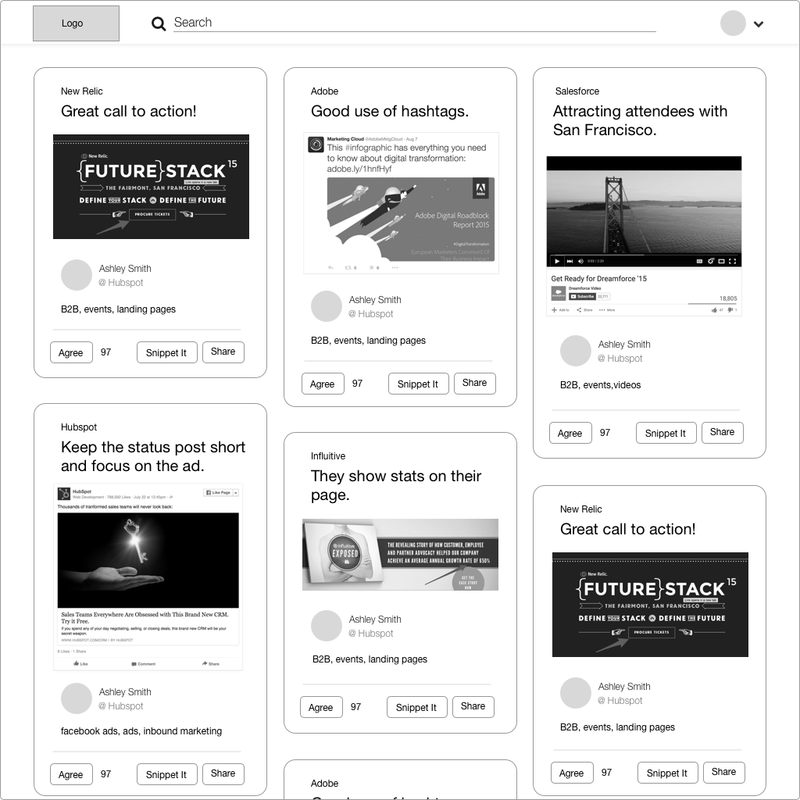 Blog style posts are easy to digest and great for social media shares. It is time-consuming and difficult for marketers to keep a pipeline of new content. Tying the two together, we help companies generate authentic customer stories while recognizing the advocates for their achievements. vendors: customers that purchase Upshot as part of their content strategy. 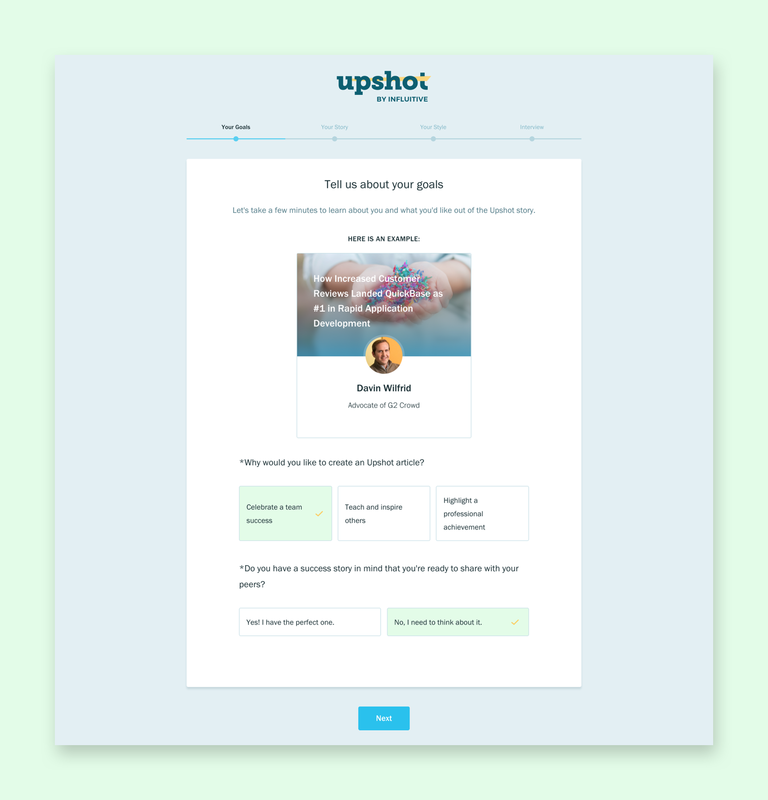 As a result, we created three separate Upshot experiences for each type of users—contributors, vendors, and readers—with a focus on the first two. 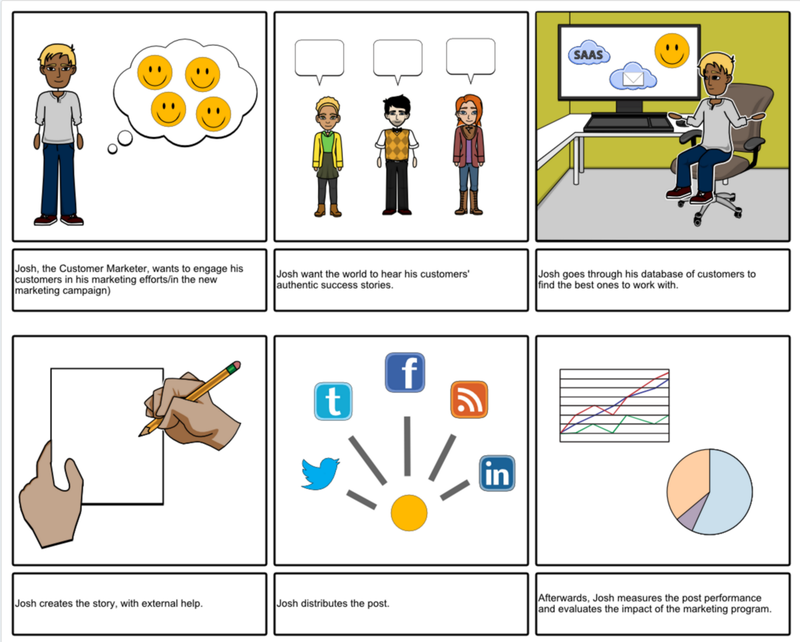 User storyboards. Left: Contributor storyboard. 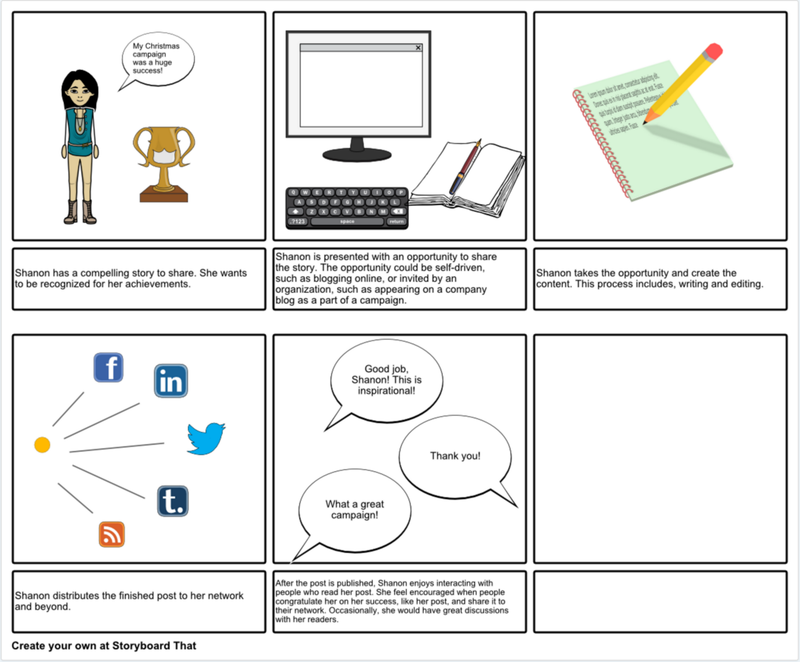 Right: Vendor storyboard. For MVP, I lead the interaction design, user testing, and set branding direction. I worked with a UI designer to create the visuals. You can find the mood board I recreated to help guide the UI designer here. 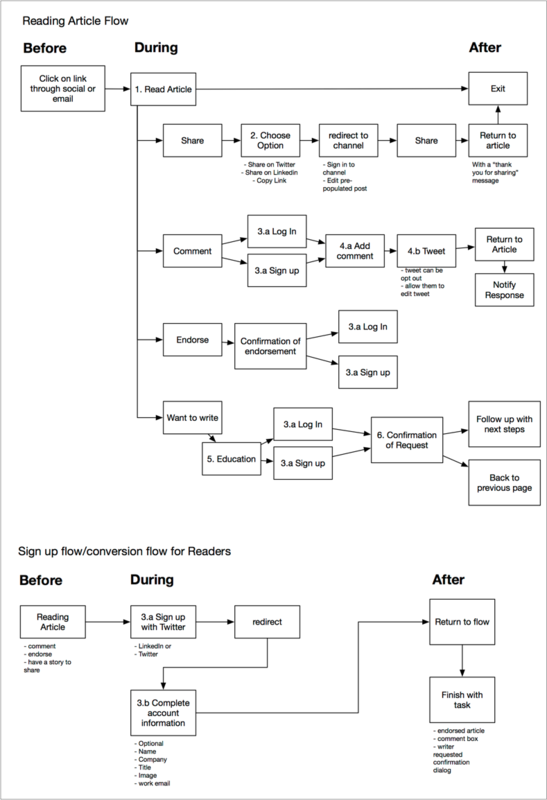 We iterated the publishing experience for contributors so it is simpler and faster. In order for our editors to better work with our contributors, we included a quick questionnaire during onboarding to collect basic information about their needs.